I have three small children, all under the age of eight. We get a lot of picture books for review around these parts. On the one hand, that's super exciting. It's always a curious thing to see what a package of books sitting on our doorstep might hold. What treasures await!? And on the other hand, it means we read a lot of picture books - some we end up loving and others, well, not so much. Here are some of the ones we have received of late that we did end up liking fairly well. 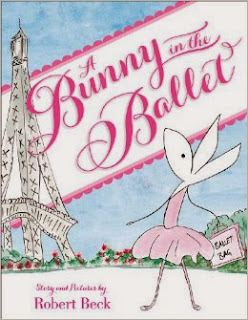 We will start with A Bunny in the Ballet which is a new release from Robert Beck. Beck provides both the stories and the illustrations for this book. It tells the story of Désirée Rabbit who loves to dance. However, there is one problem: THERE ARE NO BUNNIES IN BALLET! That's true, of course, until Désirée. She shows such enthusiasm and joy for dancing that the local dance master agrees to give her lessons and she proves that bunnies can be beautiful, graceful, wonderful ballet dancers. I think this story is cute but I can't say that the illustrations impress me all that much. Beck uses simple lines to illustrate his characters and scenes and while this works on some page spreads, I think it leaves a little more to be desired at others. It's hard to tell that at times that Désirée is a.) a rabbit and b.) that she's dancing. However, my children seemed to go with the flow of his lines quite well and I'm speaking entirely for myself in making that last remark. It was requested that I read this book three times straight through immediately upon its arrival. If you have a little girl who loves PINK and loves to dance, you might consider this title. 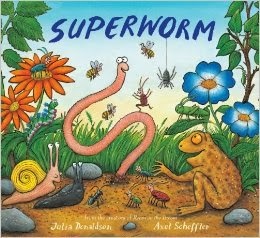 Next up we have Superworm , by Julia Donaldson and Axel Scheffler. If those names don't immediately strike a chord with you, perhaps they will in a minute. This story, told in rhyme, reveals the super hero you never knew existed - SUPERWORM! Hip, hip, hooray for SUPERWORM! He helps avert disaster everywhere you look. He saves baby toads, beetles and beats boredom wherever it may lurk. As I was reading along I noticed that the animals looked a bit familiar. On one of the last page spreads there is a picture of a mouse and everything came together: Donaldson and Scheffler are the creators of The Gruffalo! And so, despite his worminess, I fell in love with Superworm right away. Happy to read this one and happy to recommend it to all of you. Check him out! Many thanks to Scholastic Books who sent a copies of the above titles our direction in order to facilitate these reviews. Moving along to another set of animal books, we have Noisy Farm which is a touch and feel board book. Plus (or minus, depending on how you look at things) it makes noise! On each page spread of Noisy Farm the young reader is invited to pet various farm animals, including a cow, sheep, horse and rooster. As their little fingers touch the part of the animal which looks visually different (indicating the park you are to touch) you can hear the specific sound that that particular animal makes. I've never seen a book that you can touch-and-feel AND listen to and I thought it was kind of cool. So did my daughter. If you don't mind a little noise, you might wish to look up this book for a young kid who is learning their animal sounds! 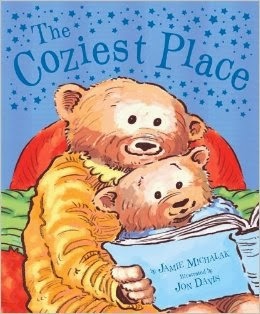 Lastly, for this post, I have to introduce you to Coziest Place by Jamie Michalak. It may be cold outside but it's cozy inside! This family of bears head inside from a snow play day and find a home full of warmth and love. The young bears take off their snow clothes, enjoy some warm soup and sandwiches and then cozy up on their reading chairs. The day wraps up with warm cookies as a special treat and then its time to be tucked into warm and comfy beds for a good night's sleep. The coziest read about the cozy, comforting love of a family. A perfect winter read (but good any other time of the year as well). Super duper cute and satisfying! I highly recommend this one to you! Many thanks to Tiger Tales Books for sending the later two copies my direction in order to facilitate this review. I have received no additional compensation for this post (other than the books in question from the individual publishers) and all opinions are, as always, 100% my very own! I read (and posted about different a Donaldson/Scheffler book last week! It's so good. Ah, yes! Some real cuteness there! Those all sound pretty cute, especially the last two.